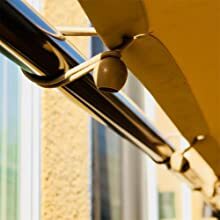 The canopy is an excellent shade and shelter solution. 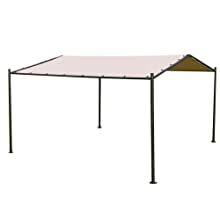 This shelter is great for any seasonal shade scenario and provides shade during an outdoor gathering or used as a detachable carport. 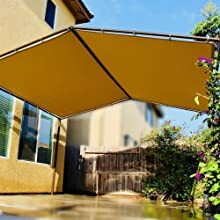 The carport Canopy is an excellent shade and shelter solution, 13 x 11.5 feet garden gazebo has a large space, provide more shade room, more leisure and entertainment space. 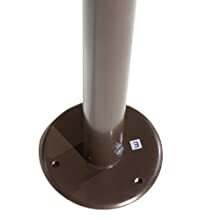 The garden gazebo is constructed with sturdy powder-coated steel frame, resists chipping, peeling, rust and corrosion and provides increased stability. This kind of steel construction can use year of year. This design makes the gazebo more stability, The heavy-duty bungees cord tightly secure the tarp cover to the frame. Make the connection of the tarpaulin and the steel stronger. The polyester fabric is top-long lasting, fade resistant, waterproof, easy to clean and UV resistence.It's make the gazebo become the place that will provide you with sunshade and keep off the rain.